The Team JMP brought not less then 11 "Variante(s)" Horten Wings to Inter-Ex, 6 of them owned by Gerard Jumelin. Each member of the team flew the smallest two sizes (50 and 60 cm wingspan). If the whole team flies the variant 50, there are less then 90g in the air. Gerard Jumelin designed, shaped (6mm Depron) and painted all these variants for the team. Jean-Yves Martin is the co-designer of these smaller versions - putting the r/c equipment into the foam is a lot of the work. JMP solutions and Team JMP are not the same. JMP solutions = Jean-Maire Piednoir solutions. Servos (1,4g) and receiver (1,7g without quartz) are developments of JMP. The servos are working by the principle of the magnetic stream (magnetischer Fluß). A swinging attached magnet is moved by this stream. (I hope this english is not too bad - please help me to make it better). 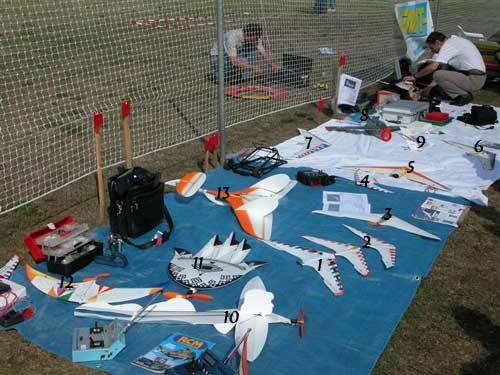 Gerard Jumelin and Jean-Marie Piednoir: 2 Variante 60 "V-60", wingspan 60 cm, KPOO motor with gear 1:2,7, propeller 3x3 GWS, R/C by JMP solutions, weight 33g incl. lead. The V-60 with red wing tips and yellow canopy belongs to Gerard, the other one to Jean-Marie. Gerard Jumelin: "V-50" Air Mail - Mail Art, Gewicht 28g, 1 cell Kokam LiPoly 145 mAh. There are three of these V-50´s, each one with another stamp on it - more on the next page. Gerard Jumelin: V-90 pale yellow foam board with orange leading edge reinforced with carbon, ducted fan GWS 50, 8 cells NiMH GP 300 mAh, weight 180g. The washout is implemented in the leading edge. 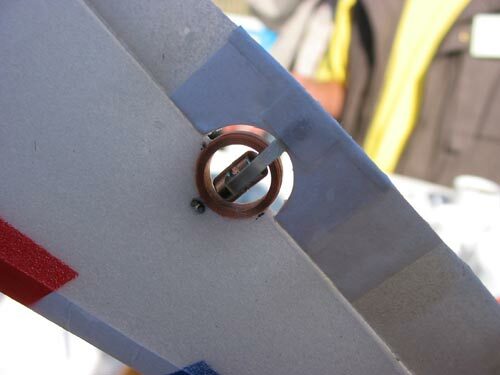 The plan in Aerotch #1 showed the heretic way to cut this wing with a hot-wire bow spanwise with only one template for the washout. The wing is as slim as the 6g servo - 10mm. Gerard Jumelin: And another V-90, blue leading edge, red nose, direct drive GWS motor, propeller 3x3. This V-90 is as slim as the 6g servo - 10 mm. 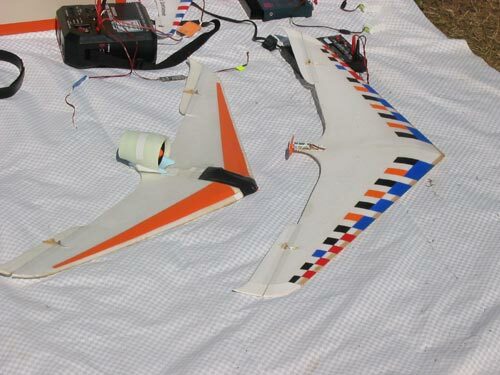 Balsa und carbon reinforced leading edge, weight 150g. Gerard Jumelin: Variante 100, weight 150g, 3 mm Depron hollow wing with balsa leading edge, no ribs, flat bottom profile. 8 cells NiMH GP 300 mAh, Kontronik engine and controller, GWS receiver and 6g servos - The plans are available in the french Aérotech-magazine. Laurent Berlivet: Focke Wulf TA 183 ducted fan, tested and flown by Laurent. Jean-Michel Quetin: Tricky - a kind of micro Zagi, built like a Pibros. The kit is sold by NPM / Paris. Gerard Jumelin: "Fatimain" (Fatimas hand), GWS motor geared 1:7, built of Depron, weight 160g, wingspan 56cm, lenght 70cm, GWS receiver and servos, Kontronik controller, the plan was published in "Looping magazine". Gerard Jumelin: "la Luna" (ital. the moon, a homage to Federico Fellini´s movie "la voce de la luna"), a Horten-wing with 6mm Depron, wingspan 76cm, DC 5,2-4 motor with gear 1:6,3, propeller 6x5, JPM Solutions receiver and controller, GWS 6g servos, weight 77g, 2 Kokam LiPoly 145 mAh cells. 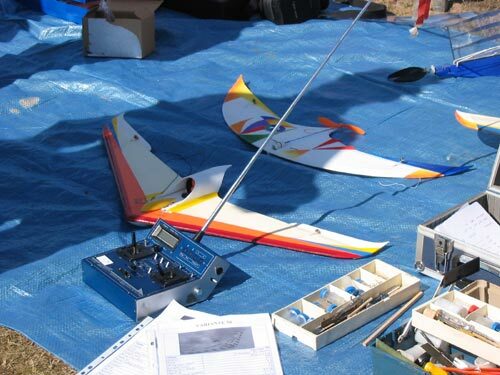 Gerard Jumelin: "Kan´ Art", wingspan 100cm, Speed 400 direct, 7 cells 500 AR, Günther Prop, weight 450g. The plan was first published in "Looping magazine #62" in april/may 2000 as an indoor wood laminated model with a wingspan of 90cm and as a 72cm flat Depron-board. Later, another article described a 80 cm wingspan hollow wing version. Gerard Jumelin enlarged the plan to a wingspan of 100 cm. The name Kan´ Art comes from a french meal: canard à l´Orange. Gerard Jumelin: "La lune" (the moon), a Horten-wing with 6mm Depron, wingspan 76cm, DC 5,2-4 motor with gear 1:6,3, propeller 6x5, JPM Solutions receiver and controller, GWS 6g servos, weight 77g, 2 Kokam LiPoly 145 mAh cells. Here you can see one of the servos developed by JMP solutions. 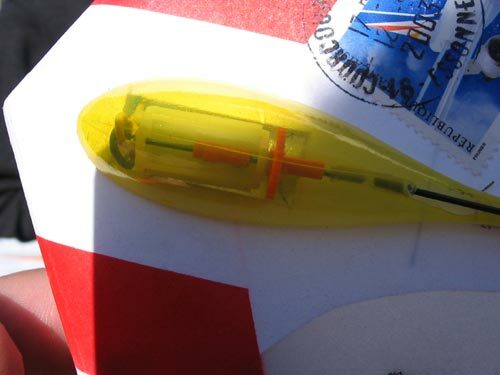 The gear is connected with silicon tubes to 1 mm carbon shaft with the propeller.